Updated Sunday April 14, 2019 by NCHU Webmaster. 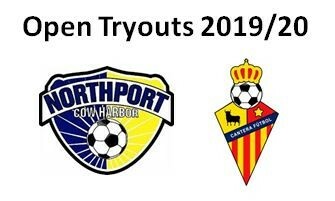 The Northport Cow Harbor United Soccer (NCHU) club is one of the premier soccer clubs on Long Island and home to several division and state champions. We are looking for talented and competitive players to join us and will be holding open evaluation sessions for the 2019/20 seasons. Interested players from outside the club are encouraged to join NCHU’s pool training environment and have to opportunity to play alongside current players and be evaluated by trainers and coaches. We believe these open evaluation sessions create an optimal environment for all players to give their best effort. All out of club players interested in attending one of our open evaluation sessions MUST register for the tryouts on the NCHU.org website. Player placement and team formation will be announced at the end of the LIJSL/US Club spring season. -All participants are expected to arrive 15 minutes prior to the start of session to confirm their registration and attendance with one of our trainers. -All participants must have a ball, wear shin guards, cleats, and bring water. -In the event of inclement weather, postponements will be announced through the NCHU Website. -*Northport Youth Center will refund your registration if you make a travel team. For questions regarding player evaluations please contact the appropriate age group coordinator.